Clinical credit can also be obtained through direct supervision of practitioners located in West Virginia, Ohio, Georgia, Virginia, Virginia Beach, Houston Texas, Washington DC, and Maryland. 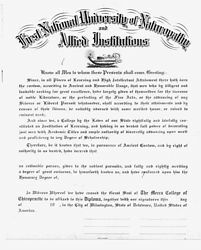 First National University of Naturopathy and Allied Sciences dates its foundation from 1905 with the founding of its first constituent college, The New Jersey College of Osteopathy. The National University was formally incorporated by Congress in 1919 as a University level, degree granting institution, which it remains although no longer situated in the District of Columbia. First National University, The National University of Therapeutics, and United States School of Naturopathy and Allied Sciences are all used by the University and by its constituent colleges. F. W. COLLINS, M.D., A.M.
Beginning in 1905, when the first Institution was incorporated and chartered. 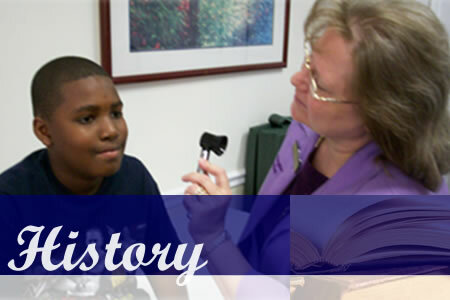 The following material provides an introduction to the history of the University. Dr. Frederick W. Collins, Founder of First National University, New Jersey College of Osteopathy, Mecca College of Chiropractic, the United States School of Naturopathy, etc. Known as the Consulting Drugless Physician of America, Dr. Collins was a true Renaissance Man, with doctorates in Medicine, Naturopathy, Osteopathy and Chiropractic. A prolific author and speaker he helped to form, advance and define the new Profession of Naturopathic Medicine. At the Golden Jubilee Convention of the American Naturopathic Association, held in New York City in 1947, Dr. F. W. Collins received the award of “Dean of Naturopathy” as he was the last of the five great Naturopaths of America - Lust, Lindlahr, Collins, Riley and Tilden. Through his efforts in New Jersey, licensure for Osteopaths and Chiropractors was obtained and Naturopathic Private Board Licensing instituted. The Naturopathic world was given exciting news in 1917. The headline of the Report of the 21st Annual Convention of the American Naturopathic Convention reads: "Decision Reached On Establishment Of Universal Naturopathic University And Hospital". Work had actually begun to establish the university much earlier by Dr. Frederick W. Collins. Dr. Frederick W. Collins was one of the early students of Dr. Benedict Lust, who brought the Kneipp Cure to America under direct assignment by Fr. Msgr. Sebastian Kneipp.Dr. Lust adopted the name Naturopathy for the profession in 1895 and founded the American School of Naturopathy. Dr. Collins, who was a good personal friend of Dr. Lust, began teaching the first students in his office in the late 1890s. As the numbers grew he founded the New Jersey College of Chiropractic and Naturopathy in 1910. 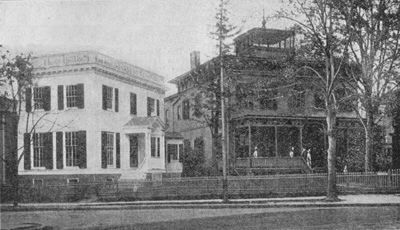 In 1911 he split the school into the New Jersey College of Chiropractic (later renamed Mecca Chiropractic College) and the United States School of Naturopathy and Allied Sciences. The National University of Therapeutics was founded by Joe Shelby Riley and Hallan N. D. Parker, in association with Dr. Collins for the teaching of all types of medical and allied therapeutics, particularly those of what is now termed Alternative Medicine, and became the flagship of the University system. Functioning under both names, First Natioal University and The National University, the University is the oldest accredited university in the world teaching Drugless, Alternative Medical, Naturopathic, Allied Health Sciences, and Academics. Original Home of First National University, Newark, New Jersey. The University is the only school in the world which has the historic right to offer this degree. Founded by Dr. F. W. Collins, the degree of Philosopher of Naturopathy represents the pinnacle of the Philosophy and the Science of Naturopathic Medicine. The degree has been offered since 1911 to those Naturopathic Physicians who have given new therapies and techniques to the Profession through the United States School. Recipients are required to hold a degree in Naturopathic Medicine and a Doctor of Philosophy in a health field before consideration. Degrees of Philosopher of Medicine, Philosopher of Alternative Medicine, Philosopher of Osteopathy, and Philosopher of Chiropractic are likewise offered to those worthy of this high distinction. 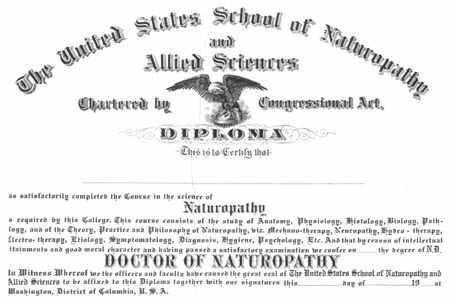 Degree of Doctor of Naturopathy from the United States School from the 1920s. 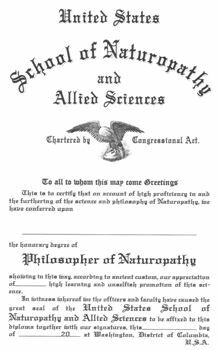 This is an actual copy of the degree of Doctor of Naturopathy (N.D.) from the United States School from the 1920s from our archives. As one can see from the various courses listed this is a Physician's level course of instruction. In 1960 the National University has founded the degree of Doctor of Naturopathic Medicine (N.M.D.) as a part of our commitment to restoring the high standards of the true Naturopathic Physician. The University has always been in the forefront of true Alternative Medical and Naturopathic education. This letter from 1922, written on U.S. School stationary as part of the University, shows the University's leadership both in establishing and standardizing quality Naturopathic education. The University maintains its commitment to the finest Alternative Medical and Naturopathic education available in the world. 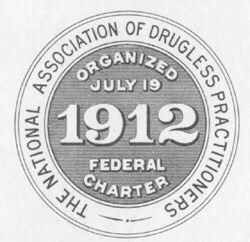 Seal of the National Association of Drugless Practitioners. The University has been a member of, and accredited by, the NADP since 1912. Arlington, New Jersey, October 31, 1930. This report is transcribed immediately below. We have only two schools in or around Newark teaching Naturopathy, -- one in New York City and the other school is the well-known First National University of Naturopathy in Newark, N. J., with Dr. Frederick W. Collins as Dean. I cannot restrain myself from giving a few words of appreciation of Dr. Collins and his great and untiring efforts in behalf of Naturopathy in America. 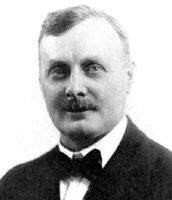 If anybody deserves the name of "Father of Naturopathy" it is Dr. Collins. He has done more for the cause of Naturopathy to make it known and respected than any other man living. Thanks be to him that we still have a school of Naturopathy in New Jersey. All the other schools have been closed or have been compelled to leave the State, but Dr. Collins has successfully fought every attempt made by our powerful and influential enemy the Medical trust, A. M. A., to close the school, and with great financial loss has kept the school open. Is it fair that only one man should carry this heavy burden and responsibility alone? No. Let us be men and rally around our, I say our school, support it, boost it, and bring it to such a standard that we may point with pride and say, "This is our School" and that the diploma earned at the First National University of Naturopathy will be respected by all men and recognized by every educational institution in the world. This is no mere day-dreaming but it can and must be a reality or we may lose forever our opportunity to serve and save our suffering fellowmen and then we have failed in our God given trust and put our light under a bushel basket instead of letting it shine for the whole world. We have a good deal to learn from the A. M. A. and the first lesson ought to be this -- raise the educational standard of the drugless physician that it may favorably compare with the standard of other professions. We must remember and recognize the stress placed on education in all professions today. To gain the respect and confidence of the public we must have proper education. The entrance requirements of an applicant wishing to study for the degree of "Doctor of Naturopathy" must be a graduate of a High School, or have Qualifications equivalent. The Board and League appoint and elect a Board of three members to act as an advisory committee. A complete curriculum be mapped out consisting of everything relating to the Nature Cure and conscientiously followed. A request be sent to every practitioner to recommend the school and send to the school at least one student a year. The school be recommended in newspapers and magazines in a dignified and professional manner. This report is transcribed below. The most convincing proof of the humanitarian and practical value of drugless healing is the definite character of its advances.Steady progress in every division of drugless and knifeless healing is evident, particularly in the last year. This is not only shown by the Federation survey, but in the establishment and growth of drugless schools, colleges arid health resorts where natural methods are taught or employed. It is particularly indicated by the medical statistics which state that the number of patients applying for medical treatment is decreasing while more and more patients are resorting to natural methods of cure. Primitive man knew instinctively that the sources of healing are no different than the sources of life itself, and that by applying the primal elements of Nature, recovery was sure. These primal life-sources are, as we know, food air, sunshine, water, rest, exercise, mental hygiene, and the subtler earth and terrestrial forces with which we are hardly as yet acquainted.It is the absence of these natural elements In the body or interference with them in their normal action and reaction, which produces disease; it is their presence and free play upon, within and through the body which produces what we know as health. This was understood by Hippocrates, "the Father of medicine" who advised and employed natural methods of treatment. But those who sought to follow in his footsteps thought these natural efficients were too simple. Instead of a simple understanding of the natural facts relating to disease, they began to weave around it an air of mystery; Instead of applying Simple natural remedies, they devised written prescriptions with Latin symbols known only to the doctor and the corner druggist; calling for magic pills, powders and patents to do the work which only Nature can perform; and instead of a simple system for assisting Nature In correction, an intricate system of meddling and frustration developed which has come to be known as medical science. A logical reaction to this system occurred. Prominent physicians, seeing the mischief which their own medical system was producing cried out against it. Dr. Oliver Wendell Holmes stated that if all the medicine in use by humans were dumped into the sea, it would be so much better for the patients and so much worse for the fishes. Others condemned the drug system still more vigorously. In Europe, particularly in Germany, medical men who had sincerely entered into practice from a humanitarian standpoint, abandoned the use of drugs and resorted to natural methods with great success. Laymen such as Father Kneipp, Preisnitz, and others appeared who had remarkable success in curing ailments by natural methods which had been given up by the medical doctors. Thus the movement away from the drug system and toward a return to natural methods spread, until taken up in America a half century ago. Progress in America has in fact been such that many Naturopathic Sanitariums, Clinics, Health Homes, and several flourishing schools now exist, which are graduating trained and skilled Naturopathic physicians, both men and women of the highest types. Among the colleges which matriculate students to become Naturopathic physicians is the First National University of Naturopathy in Newark, N.J. This college was visited by several of our Committee in September of this year.The students of the National University are carefully trained and encouraged to think and reason for themselves. Each step of progress is made by building upon the foundation of the understanding and ability of the individual student. By this method the sincere person who seeks to enter the profession of natural healing, makes rapid progress. Frederick W. Collins, M.D., N.D., the dean of the First National University of Naturopathy, is widely known both as a health-welfare educator and leader in the promotion of Natural Methods of treating disease. He was a former member of the Naturopathic Board of Examiners of New Jersey. registered physician and surgeon, member of the American Academy of Medicine and Surgery, member of the Connecticut Eclectic Medical Association, and a registered practitioner of methods other than drug giving for the prevention of disease and treatment of the sick. The Committee was impressed with the scope and thoroughness of the First National University of Naturopathy, founded by Dr. Collins as a logical development of related institutions, each with a distinguished history. 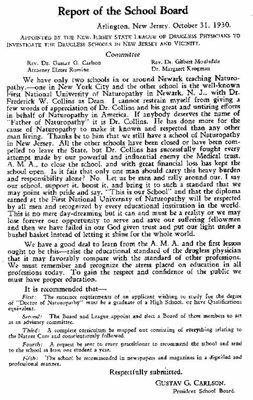 The University embraces the New Jersey College of Osteopathy established 1905 in Passaic, N.J.. now a post-graduate Institution: United States School of Naturopathy. incorporated under Federal and State laws, not for pecuniary profit and conferring the N.D. degree; United States School of Physiotherapy, incorporated under National and State laws, not for pecuniary profit, and giving the D.Ph. : National School of Physical Culture, issuing certificates with M.P; Mecca College of Chiropractic, accredited by State Boards and issuing the D.C. and Ph.C. : degrees. Two score courses are offered in the University covering all branches of Drugless Therapy. The Immutable Foot Correction Course has attained widespread recognition Students on graduation receive the degree of D.P (Doctor of Pedopractic) Advanced students acquire practical experience in the University's free clinics and in bedside practice under the direction of the faculty. The University operates its clinics and educational departments on a high plane. Taking advantages of legal and constitutional rights and the continually growing fund of knowledge resulting from research and practice in the various fields of healing, the school has been an immense factor in vindicating, dignifying and advancing the related drugless professions covered by the term Naturopathy. It is of interest and significance to know that the School recognizes the all-important place which each established method of treatment holds in the field of drugless healing. It does not stress any one of these methods as the "best". Furthermore, it teaches that patients are individuals, that different "cases" respond most naturally to different treatments, and that most often a combination of natural methods Is most efficacious. On this broad platform of healing the University of Naturopathy has advanced to prominence and recognition. The Committee was pleased to learn of the many tributes which the University has received from prominent sources, and the many splendid men and women that It has sent out to all parts of the United States and foreign countries to serve in the noble cause of healing. The University bears comparison in courses and number of Study hours with medical institutions, It offers courses regarded as essential by leaders in the field of drugless healing. The faculty includes medical doctors and the curricula cover the all-basic knowledge of the three-fold man required by any student goes much further in diagnosis and treatment, so that graduates are better prepared for the delicate task of assisting Nature in relieving and preventing human suffering. Outstanding in the curricula is the study of Iridiagriosis. This science was repeatedly attacked in the beginning, but Dr. Collins won thirty victories in Court in the successful defense of Iridiagnosis. Eight years ago, a decision by the New Jersey Supreme Court definitely established both the legality and efficacy of diagnosing pathological conditions through their registration in the fibers of the iris. The Court approved several phases of Natural methods of treating hitherto not duly recognized by State authorities. 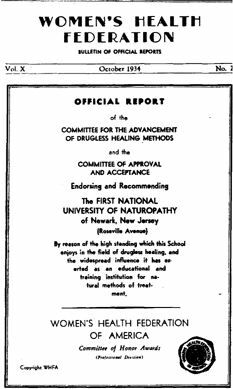 In view of the high standing which the First National University of Naturopathy has obtained in the field of drugless healing schools, and its widespread influence as an educational and training institution in the cause of natural methods of treatment, the Committee for the Advancement of Natural Healing Methods unanimously recommends that the Honor Award of 1934 be granted to this institution. Report read, verified, passed upon and approved by the Committee of Approval and Acceptance October 10th, 1934. This award is transcribed, below. Reception and Presentation of Honor Award October 12, 1934. This award is the highest distinction possible to be granted by Americas largest national organization of health-conscious women. 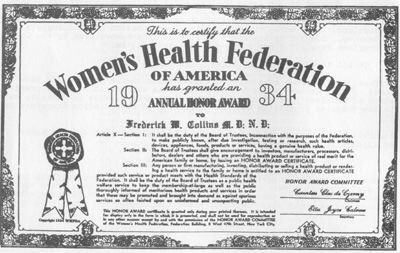 These women are banded together to protect and advance the health-welfare of the American family and home as well as to lend intelligent, co-operative and constructive aid to those who may be professionally or industrially engaged in rendering a health service or producing a health product of unquestioned merit. It gives direct encouragement by bestowing its Annual Honor Award upon those who during the Year have been engaged in rendering a service in the cause of health and hygiene. An endowed national organization advancing the Health-Welfare of the Individual, Family, Community and Nation through Health-education. 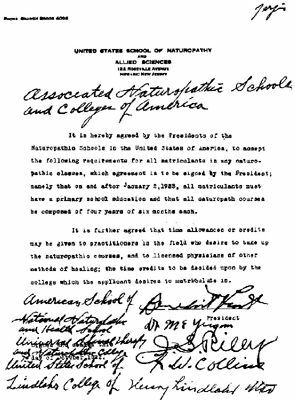 The University is a founding member of the Associated Naturopathic Schools and Colleges of America (ANSCA) - the first organization to accredit and standardize Naturopathic education. First National University and its' naturopathic colleges have been fully accredited by the American Naturopathic Medical Certification and Accreditation Board (ANMCAB) of the American Naturopathic Medical Association. They retain their accreditation from the National Association of Drugless Practitioenrs, and ANSCA and successor groups listed below. The National University has enjoyed accreditation by various Naturopathic bodies over the many years of their existence. Some of the bodies are now extinct. Indeed, as shown above, the United States School is a founder of Naturopathic accreditation. The various bodies are listed in alphabetical order, with their date of foundation.